The “Brought to You by Water” campaign at the airport. 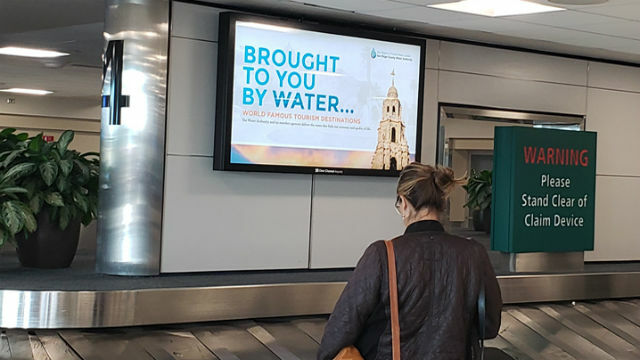 The San Diego County Regional Airport Authority is providing advertising space at Lindbergh Field to the San Diego County Water Authority for its latest public-service campaign. The Water Authority said the announcements’ takeaway message is the importance of water reliability to the region’s core industries, including tourism, manufacturing, agriculture and brewing. According to Mike Lee, Water Authority spokesperson, the electronic ad space was provided to the Water Authority at no cost, and the announcements are expected to run indefinitely. Jonathan Heller, senior communications specialist, San Diego County Regional Airport Authority, said the free advertising is valued at $32,435 annually. The venture capitalists in their van. As they invest hundreds of thousands of dollars of their own money in local start-ups, four San Diego venture capitalists are producing their own TV six-episode miniseries about their spending decisions. 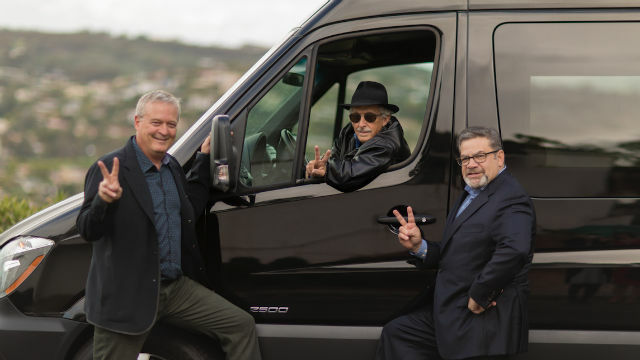 Called “VCs in a Van,” the 30-minute, documentary-style show tracks financiers Neil Senturia, Tom Tullie, Mark Bowles and Taner Halicioğlu as they deal with a handful of San Diego-based early-stage businesses seeking financing. The show highlights local companies seeking funding in two categories, including consumer food and beverage and companies developing two-sided networks. The show airs on Cox Channel 4 on Sundays at 6 p.m., Mondays at 7:30 p.m. Tuesdays at 6:30 p.m. and Saturdays at 11 a.m.
J. Walcher Communications, a San Diego PR agency, said it has been named the agency of record for Greystar, a San Diego multi-family real estate development company, and the Jacobs Center for Neighborhood Innovation. JWC said it will promote Greystar’s Park 12, a Downtown luxury apartment and retail community overlooking Petco Park. Also, the agency will guide community relations and social media for the Jacobs Center, a nonprofit foundation that works to revitalize southeastern San Diego. The San Diego Press Club, along with six other news media-related professional and networking groups, will gather for the 2018 San Diego Media Holiday Party from 6 p.m. to 9 p.m., Tuesday, Dec. 11, at the Hive, a Korean restaurant and nightclub at 4428 Convoy Street. Admission is free. 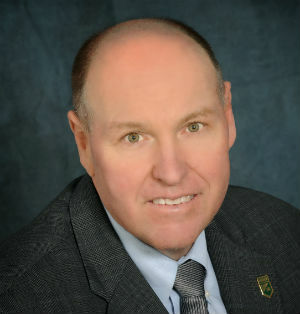 In addition to socializing, the event will feature a fundraiser to cover medical expenses of Max Branscomb, a longtime Southwestern College journalism professor who was recently diagnosed with cancer. In addition to the Press Club, members of other groups expected to attend will include the Society of Professional Journalists San Diego chapter, Asian American Journalists Association of San Diego, National Association of Hispanic Journalists San Diego and Tijuana chapter, Online News Association San Diego, Pacific Southwest Chapter of the National Academy of Television Arts and Sciences and San Diego Association of Black Journalists. Discounts on drinks, happy hour food will be available, plus karaoke. An ugly sweater contest will be held and raffle prizes will be presented.